Happy October! 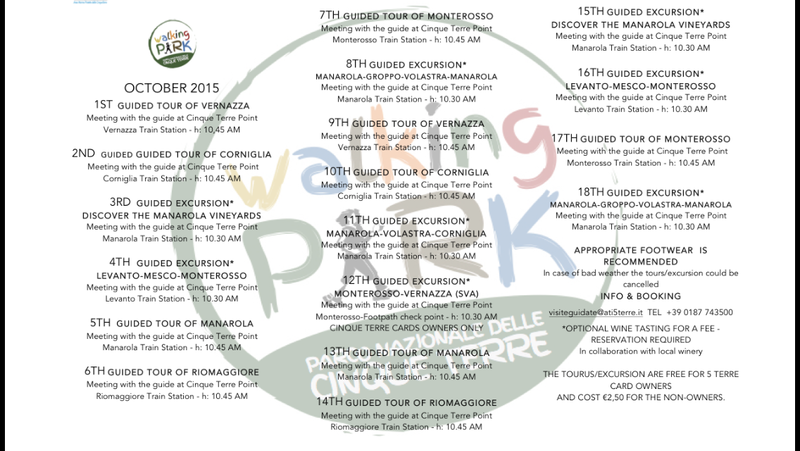 See below for the new schedule of the Cinque Terre National Park guided walking tours (of the villages) as well as hiking excursions (on the trails). To book your spot (required) send an email to visiteguidate@ati5terre.it or ring +39 0187 743 500. Are there guided walking tours the last week of April 2016? Hi Amy, we are a group of 14 photographers visiting the week of April 25. I did not see anything that week on the park page. Do you know of any tours that week?